Two dozen pharmacy residents find seats in this windowless classroom at UC San Francisco. You can tell they’re nervous. What Salazar wants these students to talk about is not other people's biases. But their own. And not just the biases they know they have. But the ones they don’t know –- or don’t believe –- they have. “Many times we think about bias and unconscious bias, they are incompatible with our conscious values, right?” he says. Before the class, students were asked to take an implicit association test, a series of timed computer tests that measure people’s unconscious attitudes around race, gender, age, weight and other categories. Salazar asks who wants to share their results. The students study their fingernails. Salazar lets the silence linger a few seconds before clearing his throat. “Well, I can share with you my story,” he says. When he took the test for the first time, it showed that he had a preference for whites, or, a bias against African-Americans -- 75 percent of people who take the race test show an automatic preference for whites. So he began to explore where these biases came from. Salazar has the students break up into small groups to discuss their test results. There was a familiar refrain in each circle, no matter if the student was white, Asian, Latino or Middle Eastern. “I was a little surprised,” one student says, about her results on the gender-career test. “And I was also surprised,” another says, about her results on the age test. A woman named Amanda explains to her group that her parents made their way to the U.S. from Iran, and settled in Marin County. She took the test that measures bias against Muslims, and another on light and dark skin tone. “I kind of went in thinking that these are two areas that I would probably not have a bias, and that's kind of why I chose them,” she says. But the results were not what she expected. Classes like these are rare. Salazar says only about a dozen medical schools in the country are teaching students about unconscious bias. The UCSF curriculum is based on a training designed by Howard Ross, founder of a diversity and management consulting firm, Cook Ross. He developed the new unconscious bias approach after realizing the traditional diversity training he was doing in the '80s and '90s didn’t work. “People who seemed to have transformative responses to those trainings, to have that kind of 'aha' moments, particularly people in the dominant group, whites, men, heterosexuals, often if you talk to them a month or two later, they actually felt quite wounded by the experience and sometimes even a backlash," Ross says. A study in the Harvard Business Review examined diversity training programs at more than 800 companies over 30 years. Turns out, overall, they do nothing to change people's prejudices or improve diversity. In some cases, they actually reinforce bias. “What happens is, ultimately, we feel bad about ourselves, or bad about the person that made us feel that way,” Ross says. So rather than making people feel bad or awkward, Ross and Salazar, more than anything, want people to accept that bias is part of being human. Salazar emphasizes that unconscious bias can’t be eliminated, but it can be managed. One student says, slow down. He tells students they can also be vigilant about bias in their work. He asks for some examples of how bias might show up in the pharmacy. One student talks about disparities he’s noticed in refilling pain medication. Other students talk about biases toward low-income HIV patients, or patients who don’t speak English. Another student says he noticed bias coming from the patients themselves. When he was in high school, he worked as a technician for an older African-American pharmacist. It’s too early to know if these new trainings on unconscious bias actually have any effect on what goes on in the exam room. Participants fill out evaluation forms after the class, and these anecdotal self-reports are often positive. But there have been no formal studies to measure if anything in patient care has actually changed. But UCSF is betting that it will make a difference. After several key faculty did the unconscious bias training, they began requiring all first-year medical school students to do it. The nursing school has long embraced the concept. And more recently, the pharmacy and dentistry schools have asked Salazar to train their students, too. 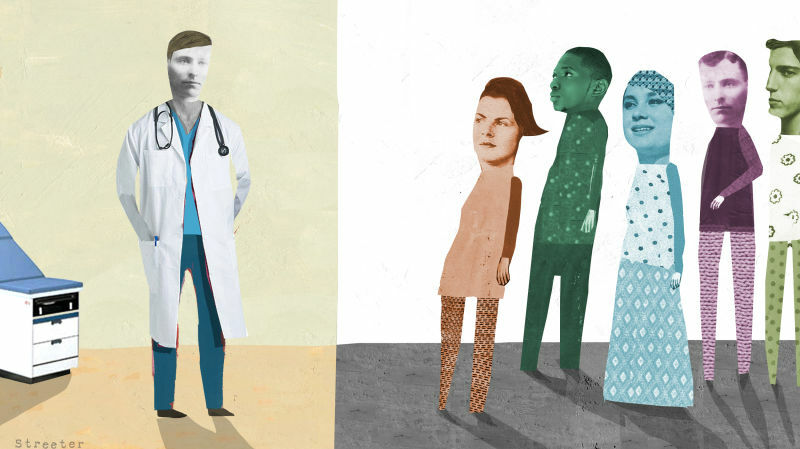 Salazar and other leaders believe the younger generation of health care providers could help shift medicine -– by learning early how to keep their own biases in check.